Well, If things are going as planned, the date on this post will read February 20th, 2012. While you would be correct in recognizing that this is President’s Day, a holiday that most institutions do not recognize, it is also International Pipe Smoker’s Day. On this day, Pipe Smokers gather in a number of venues to celebrate a bond that is created between people who keep this form of tobacco usage alive, and promote the habit to new and curious participants. It should be noted that a year ago I wouldn’t be writing this review, but publishing a video on YouTube, as I was part of an active community of vloggers who spend countless hours watching and pontificating on all things tobacco. I am currently on a hiatus from YouTube because of a lack of quiet space to shoot video, and misplacement of my data transfer cable for my camera. Today I am smoking some Blackpoint by GL Pease in a prized Mark Tinsky Christmas pipe (’87 if reading the stamp correctly) that was gifted to my by my brother for my birthday last year. In brief it is a cool, sweet and floral smoke. Now hopefully a few of you reading this are looking for information on getting started with the hobby, and for you, as part of my service to the pipe smoking community I have included some answers to questions often asked by the new or would be pipe smoker. To give credit where credit is due, the below information can be obtained from a number of sources I have used in my own education, and as well more in depth information can be obtained just by going to Google and using the search feature. Novel idea, I know. What do I need to start smoking a pipe? How much will it cost me? 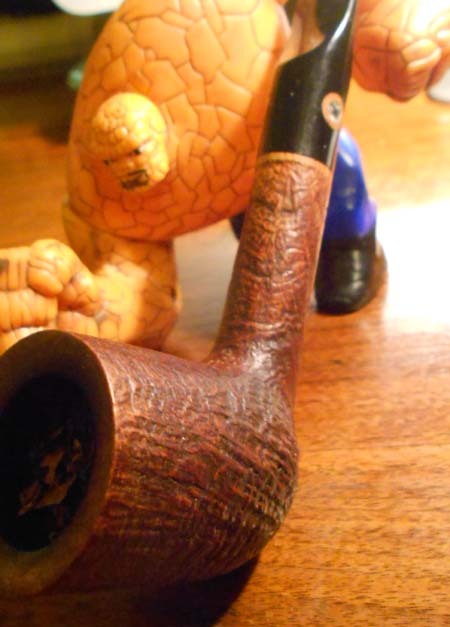 One of the very attractive things about pipe smoking, to myself at least, is the scalability of the hobby. To begin the hobby it wouldn’t really run most people more than about 20 bucks or so. For a starter pipe, corn cobs are great and can be had for about 5-8 dollars, a pipe tool, one a simple as a “nail” style will do, can be found for 1-3 bucks, pipe cleaners, another 3 bucks, and some tobacco (perhaps the hardest item to decide on) can range from 5 to 10 bucks for a 2 ounce bag of bulk tobacco from your tobacconist to a 50 gram tin, respectively. How do I choose what tobacco to smoke? First, find a tobacconist that sells a large quantity of pipes and tobacco. You might have better luck using an online source just because most tobacconists that I have encountered seem to add pipes as an afterthought to cigars and premium cigarettes. As a new smoker I would avoid anything listed as a flake or plug and search for a ribbon cut, which resembles as you might imagine, short, fine cut, ribbon. As well as cut, another aspect of pipe smoking is the wildly diverse world of blends, which at least for myself as a newbie pipe smoker, scared the poop out of me. If you are not coming to this hobby as a smoker of cigars or cigarettes, I would probably suggest beginning with either an aromatic or an English blend. Aromatics are often suggested, as am I suggesting, because they are relatively strait forward flavor wise, sweet, and easy to obtain, while the English blends, blends that are blended with latakia, burn easily and “cool”, and generally are not nicotine bombs. 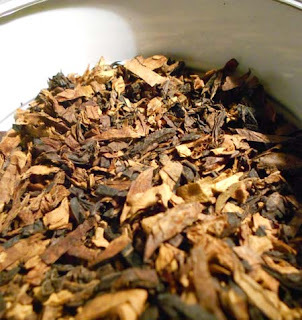 Cigar smokers, for you I would suggest most blends, including those with cigar leaf, just don’t expect to get the same experience that you get when smoking a stogie. Viva la difference. How do I pack the pipe? There are a number of different means to pack a pipe. I would suggest going to YouTube where the subject is explored in great detail, with moving pictures. Personally I use the “jam it in till its full” method, but this method is easier once you know how to gauge the density of the filled pipe. 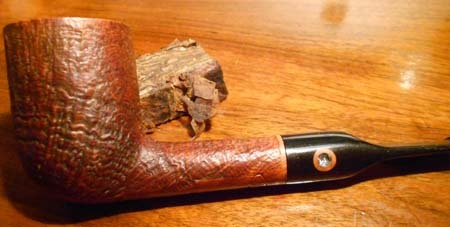 I am sure for every pipe smoker there is a unique way they fill their favorite pipe, and with practice you will learn how to pack your favorite briar with your favorite blend in a means that gives you the most pleasure. Before you begin to apply flame to that tinder, pull air through the mouthpiece, there should just be a slight resistance. If it feels like your trying to drink a triple thick milkshake, it is probably a good idea to empty that pipe and start anew. Okay, I’ve bought, and filled my pipe, how do I light it? Place the pipe in your mouth, and while drawing in air circle your flame around the whole circumference of the tobacco, trying for an even char. Once started, use your tamper on that tobacco while continuing to smoke. At this point it is highly likely your fire has been put out, this is normal, don’t go getting neurotic, this is what pipe smokers refer to as a “charring” step, designed to prime the rest of the tobacco. Just light it up again, as before, without the additional step of tampering. And there you go; you are now smoking a pipe, in the not so suggestive manner. If your fire goes out, relight it. It happens to the best of us. Try to keep pulling smoke slowly and gently; just frequent and strong enough to keep the fire going without burning down all of Atlanta. Just remember that pipe smoking is not a science, but an art, a personal art. Through the process of familiarizing yourself with the tools of the hobby you will eventually find a pace and a technique that works best for you, and brings you to that sweet nicotine and flavor induced Nirvana. If this has wetted your appetite, or if you are already a veteran pipe smoker, you might check out the Black Ops Tobacco Society. Operated by some good friends of mine, also from YouTube, it is a tobacco centric blog that often explores all of the little extra nuances pipe smoking has, as well as some good cigar related info.